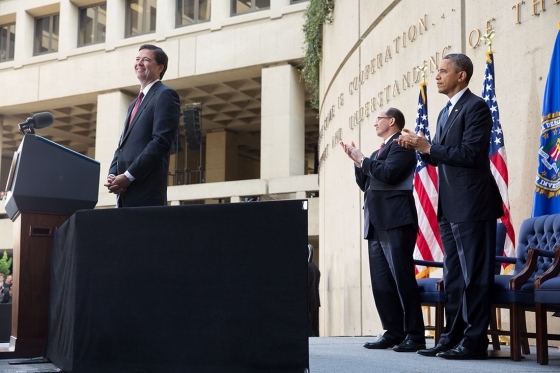 President Obama officially welcomed James Comey to his new post as FBI director during a ceremony Monday at the J. Edgar Hoover Building. The president applauded what he called Comey’s judgment and commitment, according to a White House blog. Obama said Comey was the best choice to head the FBI. “It’s just about impossible to find a matter of justice he has not tackled, and it’s hard to imagine somebody who is not more uniquely qualified to lead a bureau that covers all of it — traditional threats like violent and organized crime to the constantly changing threats like terrorism and cyber-security,” he said. Posted: 10/29/13 at 8:55 AM under FBI, News Story.